Billiot Pest Control is one of the largest local, family-owned pest control companies in Louisiana. Our company was founded in 1937 by Billiot brothers Louis, Walter, and Paul. Louis eventually purchased Billiot and brought in his youngest son Aubrey to help carry on the family tradition of exceptional service. That tradition remains strong today as 3rd Generation Owners David and Bryan continue to provide Southeastern Louisiana with superior pest protection matched with unrivaled service. Billiot Pest Control has assembled a team of industry leaders that have combined experience of over 100 years with Billiot Pest Control. Their experience provides them a wealth of knowledge to customize any service to meet your pest control needs. Our professionals work with our licensed technicians and office staff to ensure that from start to finish, your satisfaction is guaran-teed. Very happy with the service and very professional. Your man Dwight is excellent. Very professional and courteous. His service was great, as was your man who installed the termite traps. Again just fine professional service from your company. The representative was very informative and explained everything I asked. The man who did the work was very good at what he was doing. He took his time and put everything back, as well as he could, in place. EJ always gives excellent service and is very thorough. We are very pleased with Billiot’s Pest control. That is so nice to hear! We appreciate it. Thanks. Billiot Pest control and EJ are the best! Thank you for the great review! I will pass this message along to Ej. Have been using Billiot for years. Technician is punctual,friendly,on time,and works with his customers to provide excellent service. I've been a Billott customer for over ten years. Love the care of the each technician takes with the level of care that the one they come into my home to service it I can count on them for consistency every year. Their technicians and office is always right on Cass when you call with a concern. I truly recommend this company. Good service. No more bug issues since I contracted Billiots. Billiot pest control is the best on the Northshore. I have tried them all and Billiots does the best work with great prices. Thanks for the wonerful review! We are happy to hear you are satisfied with our service. We are very happy and fully satisfied with services provided by Biliots pest control.they get an A from us. It doesn’t get any better than this...Class service people and a wonderful product that really works...Rarely do we see a bug in the house and if we do they are on their backs...it all goes back to Service from the person answering the phone or the service people here at the house it’s always been first class . Mr. Kole, thanks for the wonderful review. I'm happy to hear we are providing great service all the way around. We appreciate your business. Our tech was able to come out early and explain the process. He quickly did his job and gave the the needed knowledge to contact him in a problem. Since his departure, the amount of bugs in the house has quickly diminished. One year ago I had to have my rental house put under contract with Billiot. Previous tenants had moved out leaving behind a horrible bug problem, to disgusting to tell. With very thorough tech's the house has been ridden of any further problem. This was especially important because my granddaughter's family was moving in with a brand new baby! I would highly recommend Billiot Pest Control. Thanks, Northshore resident. great service and service man is excellent at explaining everything he is doing. Made a number of inquiries for a reliable, professional, affordable and knowledgeable pest control company to treat our home on the Northshore. After researching each one, Billiot won on ALL counts. The field technician explained the process and results of each treatment. Answered our questions. 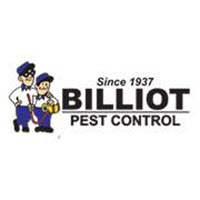 Billiot Pest Control is the way to go for ALL your pests control needs. A Very Satisfied Customer.!!!.. The service is helpful and friendly. Comes when I have a problem. Their service man is excellent. Friendly personnel who do a great job. Tech was friendly and knowledgeable. There is only one company to use for pest control needs and that is Billiot pest control. Thanks for the nice review! We appreciate your business. I have been with Billiot Brothers for over 10 years I have always been pleased with their service and have never had any problems. Technician for our quarterly pest control is incredibly punctual and polite, conscientious and competent! THANKS! Great service received from Dwight. Arrived on time, explained every thing and was very friendly. Always dependable and prompt with their service. Plus, they are nice people to deal with. Mr. Tsantes, Thanks for the complimentary review. We truly appreciate your business. We have used several different pest control companies and have been very disappointed with the lack of professionalism. Billiot has been great, always on time, always following through. We highly recommend them. Alan and Lisa, Abita Springs. We love our bug man! Your service man is a great guy! We enjoy seeing him at each check up. Always on time, friendly and very thorough. WE are happy with the work you do in the Retirement Community. Billiot Pest Control has been providing service to our house for the past year and has done an excellent job. They are professional in all aspects of their business.